As we approach the 10th anniversary of his debut for Barcelona, we look back on a career that has both defined this era of soccer and stood apart from it. Lionel Messi played in his first competitive match for FC Barcelona 10 years ago this month, on October 16, 2004. He was already famous, of course, among the hardest-core coterie of Barça fanciers, the types who write forum posts about training-academy gossip; to the rest of the world, his eight scoreless minutes at the end of Barcelona’s 1-0 win over Espanyol didn’t do much to make him a household name. Still, if you watch the video now, it’s pretty clear, even allowing for the benefit of hindsight, that at 17 Messi was a frightening talent. He’s not ready yet, not quite, but he already has that strange quality of slant directness, that mysteriously straightforward elusiveness, that would later make him seem magical, insoluble. Probably he was born with it. The top-line definition of “prodigy” in Webster’s is the standard one about a gifted child. The next two refer to “a portentous event : OMEN” and “something extraordinary or inexplicable.” And maybe that’s the right frame for appreciating early Messi — that you have to go three numbers deep in the dictionary before he even starts to exhaust the word. It has something to do with balance, this quality, with the way the planes of his body intersect the x-axis of the pitch at just slightly odd or unexpected angles. You notice, in the video of that Espanyol match, that when he’s running straight ahead over the ball he’s also leaning fractionally to his right. When he cuts to his right, he has this weird ability to sort of counter-lean to his left — and sometimes not even to actually do it, but (and this is where it gets impossible to talk about Messi) just to seem like he’s doing it, to give the impression that he’s tilting in a way that defies the basic arrangement of masses and forces in play. It’s as if your brain is registering microdegrees of movement that your eye can’t really see. When he does the surprising thing, it looks normal, because you already felt a steady-state, low-level surprise watching him do the normal thing. Here’s what I mean. A few times in his debut he gets the ball past Espanyol defenders who thought they had him covered — he breaks through toward the goalkeeper or whatever. At these moments your reaction as a viewer exactly tracks what those beaten players must have been thinking. He puts you in their place. It’s an early glimpse of the slow-blooming wonder that, among both viewers and defenders, would be his calling card over the next decade. I understood what was happening the whole time. Only how did you end up there? It would take a few years, and one earth-shattering wondergoal, for the murmur around Messi to gather into a roar. Still, though. Ten years.1 Those 10 years have both defined this era of soccer and stood completely outside it in fascinating ways. There are people who’d argue that his debut with Barcelona actually came sooner, in a 2003 friendly against Porto in which he played for a few minutes. It’s true that that was his first appearance with the senior team. It was a friendly, though. And FC Barcelona itself regards the Espanyol game as his debut. His first contract was written on a napkin. That’s the detail that still jumps out, no matter how shopworn the mythos of his childhood becomes — the upbringing in Rosario, Argentina; the local-club youth team (“the Machine of ’87”) that lost one match in four years; the diagnosis with a growth-hormone deficiency at 11. How his father worked in a steel factory. How his mother did some cleaning part-time. His medical treatment cost $900 a month. They hoped a soccer team might cover the cost. The Messis had relatives in Catalonia, through whom they were able to get the tiny Leo a trial in front of Barcelona sporting director Carles Rexach. Rexach had spent 22 years as a winger for the club and served as an assistant under manager Johan Cruyff, himself one of the greatest attacking players ever; I bring this up only to give you an idea of what it might take to make Rexach flip out over a soccer talent. What he expected from the trial, I have no idea; Horacio Gaggioli, the agent who helped connect the Messi family with the club, has said that the first time he saw Leo, he was “open-mouthed” — not with awe, but because “he was so small and skinny that the notion of him playing football seemed impossible.” But — well, here’s a video of Messi as a kid, footage from before he signed with Barcelona. You can guess how Rexach felt. Nine hundred dollars per month maybe doesn’t seem like a lot here in the belly of soccer’s Emirates Airline Epoch, but there was also the cost of moving the family to Spain, etc. Plus, Barcelona is a club that once let a 16-year-old Cesc Fabregas leave on a free transfer to save on his wage bill, so who knows. 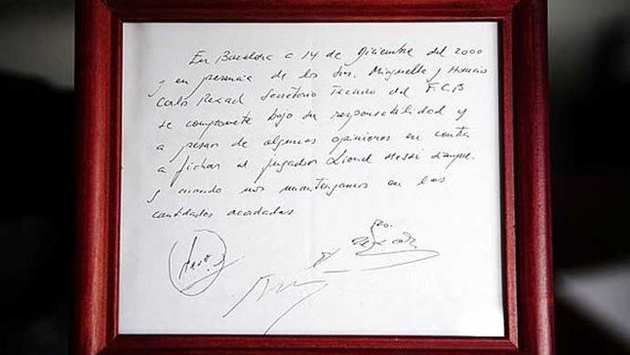 In Barcelona, on the 14th of December of 2000 and in the presence of Josep Minguella and Horacio [Gaggioli], Carles Rexach, FCB technical secretary, commits under his responsibility and despite some views against it to sign the player Lionel Messi, as long as we remain within the amounts agreed upon. It’s partly the cliché, of course, that makes the napkin thing feel so poignant. It’s the Picasso-paying-his-bar-tab version of high-stakes business negotiation, the offhand butterfly flap that set Hurricane Leo in motion. Oh, we just did it on a napkin — and without that casual scribble, the history of 21st-century soccer looks completely different. Anyway, Messi moved to Catalonia, a big-eyed, elfin 13-year-old, and he trained at La Masia, Barcelona’s legendary academy, and he took hormone supplements, and he played for the youth team. And he got better. It’s hard to believe, looking back, that Messi spent four years on the Barcelona first team before Pep Guardiola took over as manager. They’re so closely associated with each other now — almost as much as Messi and Xavi, or Guardiola and Xavi, or Andrés Iniesta and all of them, all the players who galloped over the rest of world football between 2008 and 2012 — that the Frank Rijkaard regime seems like a warm-up act, a blip. But in fact the first Champions League trophy Messi won came under Rijkaard, in 2005-06, as did the first two La Liga titles. There were long years when he was not the center of the team’s attack, when he was Ronaldinho or Samuel Eto’o’s wingman — literally, in the sense that he played on the right wing. It probably behooves us to be a little cautious. One goal didn’t make Messi’s career, even one in which he beat six players; soccer fans knew about him before this happened, and his highlight reel would have soon been overbooked even if it hadn’t. It’s a piece of fantastic flair that had no effect on the outcome of the game.3 On the other hand … maybe you watched the video? Spellbinding is a not-inappropriate word for what he does here, with his legs churning and his floppy, teenagery hair streaming behind him — he’s 19 — and a small army of fluorescent kits converging on him like slow magnets. If you want to announce to the world that you can do anything, do everything. Maybe we needed this sort of breakthrough for him more than he needed it for himself; in any case, this was the moment when soccer fans went “oh” and quietly erased the ceiling from their expectations. It was the first leg of a Copa del Rey semifinal; Barcelona won 5-2. No one remembers this now, but they went on to lose the semi after dropping the away leg 4-0. Often while Diego Maradona himself is shotgunning Hostess Cupcakes while piloting a wobbly cartel helicopter over Dakar, but that’s another column. Eerie, right? The goals are dead ringers, down to the peeling-off-toward-the-corner-flag celebrations. Obviously, no one’s saying Messi’s goal is the equal of Maradona’s; one came in a World Cup game supercharged by resentments left over from the Falklands War, the other in a relatively forgettable domestic tournament match.5 But for Messi to have so precisely duplicated Maradona’s career-peak moment6 hinted at something bigger and wilder than soccer, something elusive to mere human reason. It was a coincidence that seemed radiant with meaning. It was something extraordinary or inexplicable, a portentous event. An OMEN. It was maybe the moment in sports that, when I watched it, felt most like magic. Although Messi did have to score his against Getafe, not merely the 1986 England national team. Later in the season he scored a handball that people compared to Maradona’s other most famous goal. All this before tiki-taka,7 before Cristiano Ronaldo ever set foot in a Liga match, before Ronaldinho left for his long, slow wipeout through Sad Times FC. By 2008 Messi was already being talked about as the best player in the world; he finished second, behind Kaká, in the World Player of the Year voting that season, and there were people who thought that was a bad result. But it was under Guardiola that the Messi legend flared into something timeless, that it became, if anything, even more improbable than the glimmering the world got from the Maradona cover-band goal. OK, in fairness, tiki-taka was clearly swirling in a nascent way in several generations of Barcelona tactics before Guardiola arrived. But it’s like saying white rock music existed before Elvis. Sure it did. But then: Elvis. That sounds ridiculous, maybe, until you take even a cursory look at his career — at, say, the 2011-12 season, when he scored 73 goals in 60 appearances. Who does that? Guardiola moved him to a false-nine position where (a) he’s free to move about where his creative whim takes him, and (b) he’s often standing more or less in front of Xavi, which is historically a good targeting reticle to hang out in if you like scoring goals.8 Guardiola implemented a tactical system that meant Barcelona kept possession of the ball at all costs, also useful if scoring goals is something you want to try. Messi scored absurd numbers of them, brilliant goals, routine goals, goals that made you make small creaking sounds in the back of your throat. There’s obviously a chicken-egg Lennon-McCartney thing there, too, though, because standing more or less behind Leo Messi is historically a good place to be if you like accruing assists. Barcelona embarked on what, if the team hadn’t seemed almost childishly positive, you’d call a vengeance trail through world soccer. Under the circumstances, it was more like a fabulously successful play date. Two Champions League titles and three La Liga titles in three seasons, plus multiple smaller trophies and an outrageous record in El Clásico. Messi won the Ballon d’Or, the trophy given to the best player in the world, four straight times. Jose Mourinho’s Real Madrid teams would defend him by literally hacking at his shins; didn’t matter. He’d score anyway. Guardiola called him, beautifully, “the only player who runs faster with the ball than without it.” He’d do stupid stuff, like finish a league season with more assists than anyone else, because why not? Those Barça teams could afford to treat stat sheets as elaborate inside jokes. He was the key player, and the most famous, on the team that defined its era. But there was always something a little strange about his game, a little removed even within the cocoon of Barcelona. The character of his dominance was so mild. You’d have expected him to grow up, take the reins of the team, get mad more. Instead he remained a kind of pleasantly neutral cipher, even as he passed into his mid-twenties. He had a baby and cut his hair and started carrying himself like an adult. But he retained so much of the quality of the kid from those early videos.9 There’s one in particular. He’s 10, and he’s surrounded by other kids in full uniforms — it’s during a match, maybe it’s halftime. And he’s just juggling the ball with his left foot. The other kids are standing close. He doesn’t seem to notice. He just watches the ball, keeps it up, foot, knee, foot, knee. He looks transfixed. You get an impression of someone so absorbed by the movement of the ball that it occupies his entire mind. That everything outside the connection he has with the ball is not quite real. Not that it’s menacing or unpleasant; just that it’s sort of to one side. He’s not interested in other people and their egos or in whether he’s being watched. He’s interested in the ball, in making it do what he wants. It’s an end to him, not a means. There’s a feeling of extreme serenity that I take from this. He played the same way as a 17-year-old. He plays the same way now. He still keeps in close touch with friends from his Rosario youth team, often texting them every day. In one way, then, it feels strange to mark this anniversary at all. Cristiano Ronaldo would RSVP yes to your banquet for him, but Messi? You have no sense that he craves it. But that’s what I meant earlier, when I said that we needed the breakthrough goal more than he did. It’s the same with the anniversary. The Grand Canyon doesn’t care whether you watch it, either. When something is that awe-inspiring, you just want to. He’s slowed down a bit — a bit — since Guardiola left. The whole team has, Neymar or no Neymar. Last season, limited by multiple injuries, Messi scored a mere 41 goals in 46 appearances, a ludicrous return that was nevertheless his lowest since 2009. He didn’t win the World Cup this summer, though he dragged Argentina to a final it had no business reaching. He probably never will. He’s 27, in his prime; but his next 10 years are not likely to be as golden as his last 10 were. How could they be? Still, I can’t feel sorry for him. He seems magical to us not just because of his awesome talent, but because the game still seems magical to him. A lot of the time, we treat what the ball does on the pitch as a means; we rush past it to talk about legacy, rankings, fame, contracts, transfers, whatever. For Messi, I think, it’s the opposite. A contract is a means. Celebrity is a means. Being in sync with his teammates is a means. Even winning is a means. The ball is the end.